A film festival that allows underprivileged Greek children ages 8 to 18 to express their creativity, learn an aspect of their culture, take a project from start to finish and boost their confidence through film. Children 8 - 18 that are interested in film. In 2018, 140 children participated. A team of international filmmakers that are interested in making a difference for young people. Last year we had 19 filmmakers from America, Bangladesh, Brazil, Egypt, Greece, India, Iran, Italy, Nepal, S. Korea and Turkey. A team of 9 children work with a professional filmmaker to make a 3 - 5 minute film. The children create the scenario, shoot the film and then the filmmakers assist the children in the editing process. The short films are screened the last day of the festival. 2 days of educational courses on the subject color (below). The last day we will screen the films to approximately 1000 of the townspeople in the open-air amphitheater in Skopelos. As we know color is extremely important in everyday life. This subject seemed appropriate to use as a theme for children to expand their minds so that they can be highly creative. 1. The importance of the hues of light in film and in life (morning/evening). What would it be like if you could not see light? How would it affect your life? 2. Talking about hues in various colors. 3. What would life be like if things were different colors than you are used to. For instance; What if the sea was pink? What if the sky was green? What if the trees were blue? A discussion about natural colors in nature. 1. Discussion with a psychologist about what different colors mean to the children. How do different colors make them feel? 2. How can you translate color in to feelings? How does a blind person see color based on a feeling? 3. Discussing the different professions that utilize color: Designers, Artists, Color Editors, Marketing Directors. How does color affect these professions? 4. 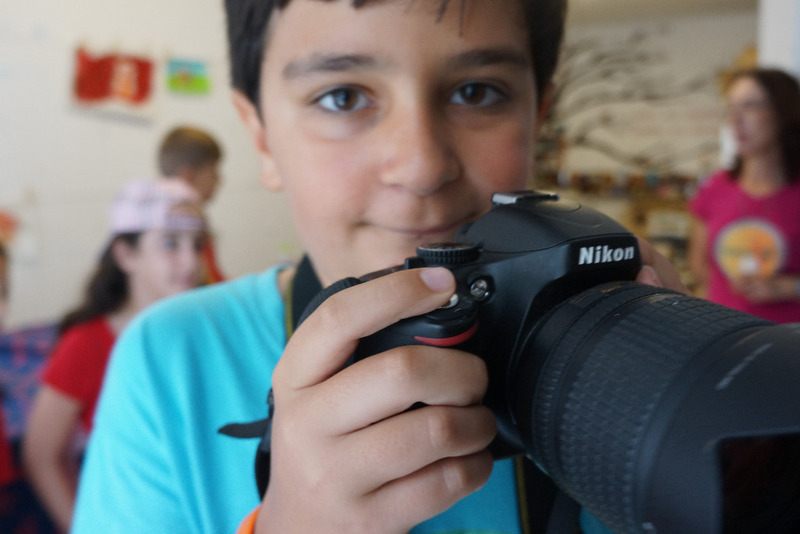 Finally, the children will work with an artist to paint imagery from Skopelos that will begin to inspire their ideas for their films. The topic seems simple. But when engaged by the creative minds of the young people from the Greek Islands of the Northern Sporades, finding the importance of and being inspired by color and will make a huge difference in their lives and in the lives of others. The children of Greece are lacking in many aspect of their lives. This is a great supplement to their education. In order for Greek children to learn, they have to spend hundreds of euros on tutors because they are not taught properly in the schools. This is why we feel compelled to organize this festival every year. It is not only something these kids look forward to, it also is such a great way for them to learn and meet people from all over the world. If this is something that looks like a good cause, please, give as generously as you can. Right now! Don’t wait. The kids of Skopelos need your help! Total Costs: $35,000 which include; food, housing and transportation for the filmmakers, equipment, supplies, festival submissions, etc.